Museum Admission includes entry to the Museum of Art and Circus Museum. This Admission does not include entry to the Ca’ d’Zan. When available, docent-led tours of the Museum of Art and Circus Museum are included with Museum Admission. All tours are based upon availability. ► Museum of Art: Guided docent-led tours of the Museum of Art are offered throughout the day, Tuesday through Sunday. All tours are based upon availability. Gain new insights into extraordinary works of art and their times. 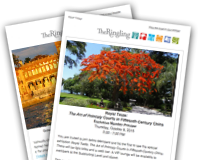 Discover how Ringling developed the collection and learn about his vision to create a center for the arts in Sarasota. Well-versed and always ready to engage, our docents lead this 40-minute tour throughout the day. Meet in the Museum lobby to participate. ► Circus Museum: Our docents will share the story of the Ringling brothers and how they worked together to develop their world class circus. You’ll also hear what life would have been like for a circus performer and learn the fascinating behind-the-scenes details of how the show all came together. These 30-minute tours are offered at 12:00 and 1:00 PM on Monday, Tuesday, Thursday, Saturday, and Sunday in the Original Circus Museum. Includes entry to the Museum of Art, the Circus Museum and a self-guided walk-through of Ca’d’Zan first floor. Includes entry to the Museum of Art, the Circus Museum and a docent-led tour of the first and second floors of Ca’d’Zan, the Ringling's winter home. Tours are approximately 40 minutes long and scheduled throughout the day. Please note► Visitors on this tour will climb a marble staircase and will stand for the duration of the tour (seating is not available). There is a historic elevator to bring visitors to the second floor of the mansion, but its use is contingent on on-going repairs. Please consult with admissions staff on the day of your visit. Motorized scooters can only be accommodated on the first floor of the mansion. A docent-led tour throughout the areas of the mansion that are not included on the regular tour. Highlights of this tour include the game room, the fourth floor bedroom, and the Belvedere Tower that provides Sarasota’s most spectacular view. This tour is approximately 45 minutes. This walking tour will introduce you to interesting botanical specimens on the estate while providing a historic overview of the development of the estate. The tour is 90 minutes in length and covers approximately 1 mile. We encourage visitors to wear appropriate footwear, preferably closed-toe, clothing, sunblock, and hats. Tours are subject to weather conditions. Garden Tours are offered throughout the winter every Saturday at 10:30 AM and must be purchased at least 24 hours advance online or by calling 941-358-3180. Art after 5 Admission includes entrance to the Museum of Art and Circus Museum. Every Monday the Museum of Art, including special exhibition galleries are free to the public. Regular admission pricing applies if you wish to visit the Circus Museum or Ca’d’Zan. Visitors with an EBT (Electronic Benefit Transfer) card receive free Museum Admission for the card holder and up to 3 guests. Simply show your EBT card and a state issued ID at the Admissions counter upon your arrival. Please note: Ca' d'Zan Admission is not included. The Ringling is offering free Museum Admission to active Military personnel, including the National Guard and Reserve and their immediate families from Memorial Day through Labor Day. Please present your current Military ID at the Admissions counter. If you wish to extend your visit, a 3-Day Pass may be purchased in advance or you may upgrade your single-day admission at the Admissions counter prior to closing. 3-Day Passes are valid for three consecutive days of Museum admission, which includes the Museum of Art and Circus Museum. Please note: Ca' d'Zan is not included and Passes are non-transferrable. ​♦ Per named cardholder- complimentary Admission to the Museum of Art and Circus Museum. ♦ 15% discount in the Museum restaurants and 10% discount in the Museum Stores. ♦ Please note: Admission to Ca’ d’Zan, programs and special events are not included.